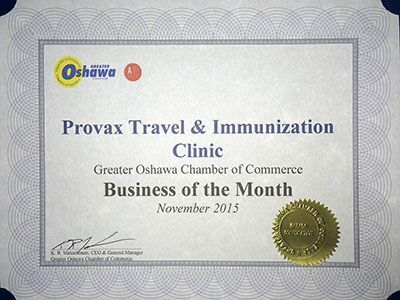 Provax Travel Clinic provides travel medical services which includes travel vaccination and immunization for any travel destination. 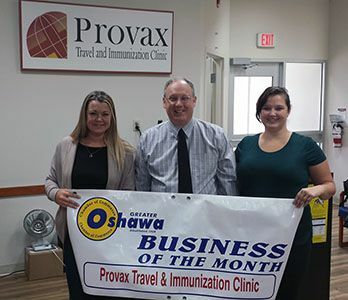 Provax Travel and Immunization Clinic is a private medical clinic that offers pre- and post-travel consultations, medication immunization and vaccinations to travellers venturing to tropical and developing countries for either pleasure, business, adventure, or humanitarian reasons. Other routine and therapeutic immunizations are also offered to the general public. Greater Oshawa Chamber of Commerce. Meningitis There are five main strains that cause illness (A, B, C, Y and W-135). The meningococcal vaccine, Menactra®protects against four strains (A, C, Y, and W-135) and is 80% to 85% effective. Meningococcal vaccines can be given to people 2 months to 55 years of age (depending on product). Immunization is recommended for some career choices and travellers, but is not publicly funded for all ages. The staff at Provax Travel Clinic were wonderful, and knew exactly what I needed. My trip was amazing and no health concerns!